I just returned from two weeks aboard a sailing ship filled with artists and scientists. Your first question might be, why? I heard about the Arctic Circle residency program during a transitional time in my life. I was weeks from unemployment and had been applying for jobs for several months already, and I didn’t really know what was coming next for me. I had been living in Ireland for more than four years and I loved it, but was it better to stay or to go back to the US? And I loved my work as a nanoscience researcher, but I had also become very active in science communication and various forms of public engagement, so would I be better off making a career transition? Was it possible to live in a way that I could do everything I loved doing, or would I have to pick and choose? 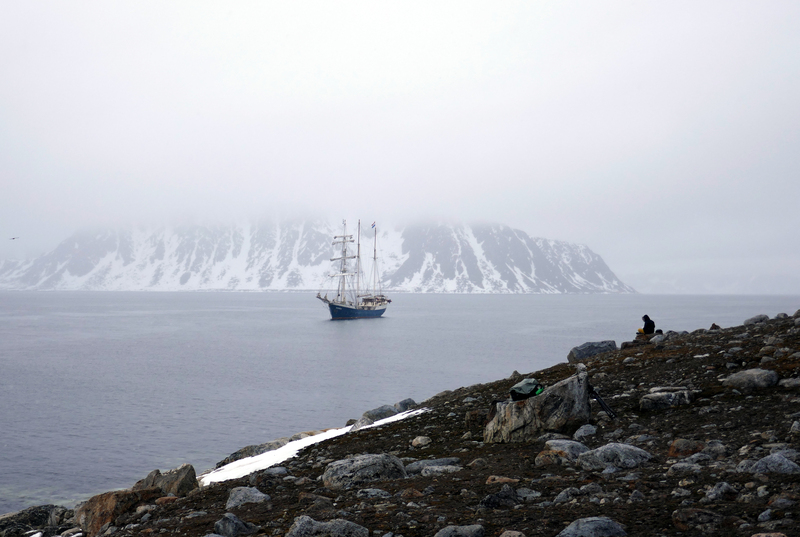 In the midst of all of this, the idea of a science/art experience, aboard a ship in the Arctic, was like a dream. Not a research expedition, not a creative hermitage, or perhaps both of those things and more. True interdisciplinarity, in a creative and inspiring environment. And what an environment! I love the wilderness, the mountains and the sea, but the Arctic has long held a special fascination for me. It’s such a stark environment: brutal and yet full of life and beauty too. The stories of Scott, Amundsen, Nansen, and Shackleton are inspiring and terrifying in equal measure. While I have no desire to freeze to death, I wanted to see the edge of the world, to listen to nature and search for humanity. So I wrote to the Arctic Circle, talked about projects I could do on board as well as my history of science communication and science/art collaborations. I was delighted to be selected for a 2017 expedition, to take place over the summer solstice during the season where the sun never sets. It was somewhat strange to have 15 months to think about and prepare for such an incredible journey, and in the meantime I got a new job, moved to a new city in Ireland, and came to a very different place than I was in when I first seriously thought about going to the Arctic.